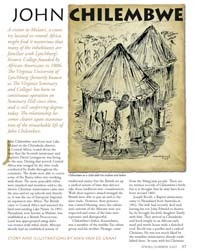 John Chilembwe was born near Lake Malawi in the Chiradzulu district, in Central Africa, round about the time that the Scottish missionary and explorer David Livingstone was living in the area. During that period, Central Africa was ravaged by the slave trade conducted by Arabs throughout the continent. The Arabs were able to coerce some of the Bantu tribes into working with them. The more peaceable tribes were attacked and members sold to the slavers. Christian missionaries came into the area and set up schools and churches. It was the era of European Imperialist expansion into Africa. The British came to Central Africa and annexed the land surrounding Lake Nyasa. In 1891, Nyasaland, now known as Malawi, was established as a British Protectorate. Land was appropriated using dubious treaties with tribal chiefs. Africans already had an established system of traditional justice but the British set up a unified system of laws that did not take those traditions into consideration. With their superior armed strength the British were able to put an end to the slave trade. However, their presence was a mixed blessing, since the culture and customs of the Africans were not respected and some of the laws were repressive and disrespectful. Chilembwe’s father, Kauandama, was a member of the warlike Yao ethnic group and his mother, Nyangu, came from the Mang’anja people. There are no written records of Chilembwe’s birth but it is thought that he may have been born around 1860. About the author: Visual artist Ann van de Graaf spent her childhood in East Africa, a place that continues to inspire and inform her work. She moved to Lynchburg in 1959, where she soon became engaged in the Civil Rights movement of the ’60s and ’70s. Her memory of those years is enshrined in Lord, Plant My Feet On Higher Ground, a three-paneled painting honoring leaders in the Hill City’s African American community (see Lynch’s Ferry Fall/Winter 1994/1995). Van de Graaf graduated from Randolph-Macon Woman’s College with a double major in art and sociology. She has been the recipient of a Virginia Center for the Creative Arts fellowship and has received numerous public commissions including murals for Amazement Square and the Lynchburg Bicentennial Commission. In 1982, she became a partner in Bargara Press, designing and publishing illustrated books of poetry and folk tales. She has lectured on African art and the “Spiritual and Symbolic Aspects of Visual Art” to adult audiences and children. In addition to serving in many capacities within the Lynchburg arts community, van de Graaf was a founding member of the Legacy Museum of African American History. She is also a trustee of the Virginia University of Lynchburg.